Slip on your overalls and bring in a harvest of fun in Crop Busters, a rousing match-three adventure for the farmer in everyone! Click and drag crops to create matches, fill trucks with produce before time runs out, and fix up your farm one awesome upgrade at a time. Buy pets to help with chores, use bonuses to win, and earn trophies for amazing feats as you plow through 100 breathtaking levels. Your eyes will light up as you turn a barren scrap of dirt into the prettiest patch of soil in the heartland! Crop Busters is rated 4.1 out of 5 by 17. Rated 5 out of 5 by Eveoflove from A fun and "relaxing" M3 game Review based on the completed game. First of all, there is NO timer. That's a good thing for me as I play those games to relax... 10 to 30 minutes at a time. There are 100 levels, but you can keep on playing new levels afterwards; I liked how level 100 spells "END" on the board. It has many concept similarities with "Farmscapes" as you own a farm and you buy upgrades with the coins you earn while playing levels. I was done upgrading the farm after completing level 80, and that's without stretching gameplay on levels simply to earn coins... You will keep earning coins after upgrading the farm to end up winning the "save 50,000 coins" award. There's no story development besides improving the "farm". I found the graphics of the tiles EXCELLENT and easy to differentiate. The boards don't have nooks and crannies to make gameplay very difficult, but they're not always simply rectangular either. The music is light, the sound effects logical (like chopping wood) and the visual effects are NOT flashy. Each board fits on a single screen, but some have a "locks" which require that a match be made next to them in order to unveil more of the board. It is possible that the unveiled portion has 1 or more locks, so a strategy tip is to open the locks as early as possible to help "simplify" the board. Gameplay is simple and well explained in the first few levels; you have 4 boosters to help you, but you only get 1 of them on a given level: the types of tile needed to refill the other boosters are absent from that particular board. You might need to "drop" gold bars or a supply truck (which you'll need to fill its quota) on many of the levels. But there's no time pressure! I think the game is fantastic either for people that are new to the M3 genre and would like to have fun while learning it (some strategy is required; it NOT a clickfest), or for people that want to relax while playing a game. Try the game for 4 or 5 levels; despite not gaining access to each power-up, you'll get a good sense of what lies ahead. The mechanics are great (you can still play while tiles are cascading), but there is 1 caveat: if you swap a tile with a "bomb" (created by a Match 4) or a "lightning" (created by making a match 5 in a row, an "L" or a "T"), your tile won't count towards achieving a match... so don't "waste" a good tile! Just like "Farmscapes" and "Ballville", I will be replaying this, especially since I had no issue whatsoever while using Windows 10. A solid 5-star score, DEFINITELY recommended to those looking for a relaxing experience! Rated 5 out of 5 by JulzCat from Save This On Your Computer...You'll Want To Play Again! This game is several years old, but still stands as one of the best match-3 games out there! The graphics are great for an older game. You match up food items that eventually go on trucks and off to the market. You have to unlock certain parts of the board and there are helpers you can collect along the way. There is also a room full of trophies you can win for achievements and the money you earn goes toward improving your farm. I believe this game goes to over 100 levels, but I generally just play until I've earned enough money to completely renovate my farm. Enjoy! Rated 5 out of 5 by lloydse from Let me look, what's the rush? Love this easy, charming little Match 3 on all counts but one ... there are charming sweet scenes behind and between levels but players are (rudely) shunted away from them immediately upon completion of a level. What's the rush? I'd prefer to enjoy those visuals for a few moments, and have the option to click "continue" when I'm ready without the results panel blocking the scene. That criticism aside, I still love this beauty. Rated 5 out of 5 by fair_cher from Most Charming Match 3 Ever! Love this game. The play is fun and interesting, even as the boards get more complex., with more things to do, like drop trucks or gold to the bottom of the board. The trucks then have to collect certain amounts of tokens, and then, with a merry honk, they drive off the board. The animal sounds are so realistic that my dog barked back. 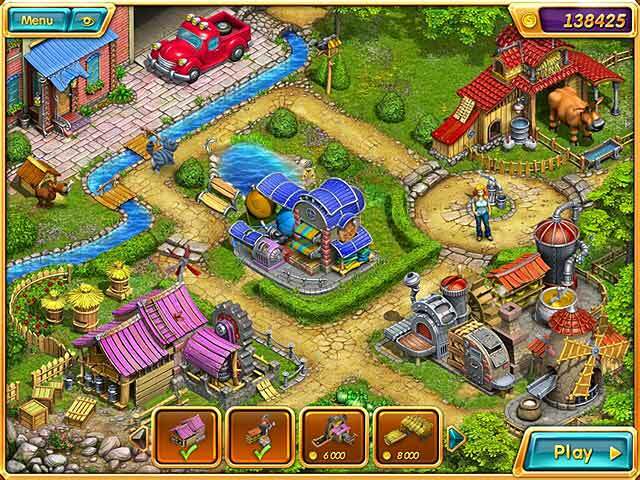 Clicking on animals or businesses gives the sounds, even in the loading of the game where corn drops into the trough, along with baby chicks. I especially enjoyed the bubbly but soothing music. All boards play well, not timed and give a sense of accomplishment. No frustrating pieces in corners or playing forever to get some super power-up to clear the board. The power-ups are really fun, especially the bear, who drags smeared honey off the board, along with tokens underneath him. This one is just loads of fun. There are no choices on what you buy, except for your dog, but I don't mind because it just plays so very well. Rated 5 out of 5 by mrm2006 from Love Love Love this game What a cute relaxing M3 game. You basically start off with a farm with nothing on it - then M3 farm items for which you earn coins. You also earn money when you drop the little produce truck off the bottom of the M3 screen and fill it up with the items it tells you to. With the money you've now earned you purchase crops, farm animals, bakery, even a day off. The storyline is simple - build your farm, the scenery is bright, the music fine - I kind of tune it out but the sound quality of it was ok. I was ARGH when the free trial ended so this is on my top 5 list to get. Glam-ma says you absolutely have to try this game. Rated 5 out of 5 by darlinbarb from IT IS FUN FOR SOME... It goes as fast as you want. I made it through level 21 during the hour, which means 79 more to go. There is no time limit, and for the young or just those that want to relax and enjoy this is for you. It is colorful and cute, and you can buy what you want which goes to the board you are playing. It is a complete match three... I will not be buying it, even at this good price, for I like a little more of a challenge. Rated 5 out of 5 by kathiebee from Go To The Top Of The List Definitely the best Match 3 ever. 3D type graphics are superb. I loved Farmscapes, but this one outdoes it no end. NON-boring. Varieties of items in the match 3 section of game as you progress add to the interest. I agree that it would be nice to be able to have a choice of buildings, as in Farmscapes, but this does not diminish the enjoyabitity of the game. Top marks for this one. 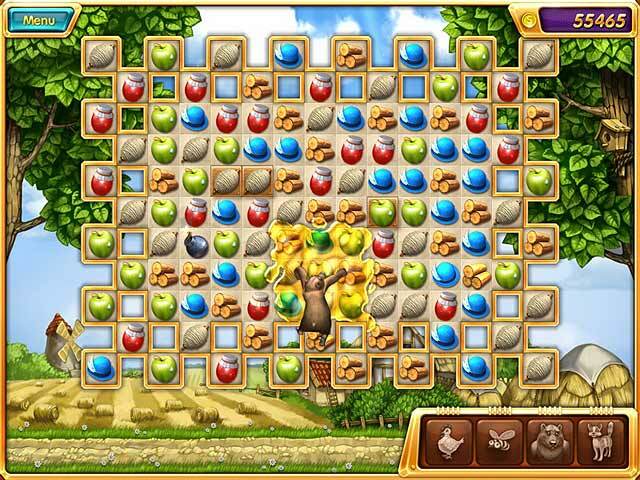 Rated 5 out of 5 by sereneorchid from Hard to go wrong with this game A top-of-the-line match 3 game, with stunning graphics and animations. In many match 3 games, the matching icons are flat looking. These icons are nicely-sized, three-dimensional, brightly-colored, and animated. The screenshots simply don't do it justice. Too often in match 3 games, you get the same icons game after game. But in Crop Busters, as you buy fantasy buildings for your farm, like a sweets factory, related icons (a piece of candy) are added to the matching games, which keeps the play fresh and interesting. Each level is different, adding chained tiles and altering the shape of the game board in unique patterns. And sometimes those patterns can be tricky to finish. But each level offers one of four animated "helpers" (earned as you play along) to bail you out of a jam. They include a bear that pulls nine tiles off the board, a hen that pecks away and breaks a stuck tile, a bee that causes the tiles to fly around like a swarm of bees and resettle on the board, and a farm cat that removes all of the fish icons off the board. The helpers refill during the game and can be used more than once. Game levels also include mini-challenges, such as dropping farm trucks off the board, which you then fill with the requested products. Add in bombs, lighting bolts, and other special effects, and the game is simply a lot of fun: challenging, but not frustratingly hard. 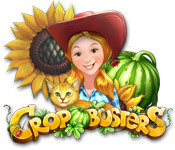 Crop Busters is a great game to relax with. Perfect for all ages. Kids especially will appreciate the graphic appeal and special effects. Let the grandparents play, too. It's a great game to introduce them to using a mouse, and this is exactly the kind of activity recommended to help with retaining memory. My only negative comment about the game is that there is no customization in designing the farm: you have to add all of the buildings, and they only come in one architectural style, so it's a little ho-hum on replay. But that's just a minor quibble, and the match 3 part of the game is just as good the second time through. Rated 4 out of 5 by mommato1 from STARTED OFF GREAT This game started off being fun however at 75% of the completion I had already purchased all of the farm upgrades so in order to complete the game I had to finish the game with nothing to do but just earn mega points and nothing to do with them. So the game was finished in order to just complete but after all of the upgrades it seemed just boring to do match after match for no reason. If you are not an avid M3 player then maybe purchasing the upgrades would take you longer. Would I recommend this game yes if you are a beginner and no if you are advanced. Rated 4 out of 5 by Ethereal924 from Cats & Honey - 2 of my favorite things.... This was a simple,cheerful and fun little game. This was my first ever Match 3 purchase...that's how much I liked it. You start the game with the basic puzzle and as your earnings grow, you can buy upgrades to your farm, which are then added TO the puzzles. 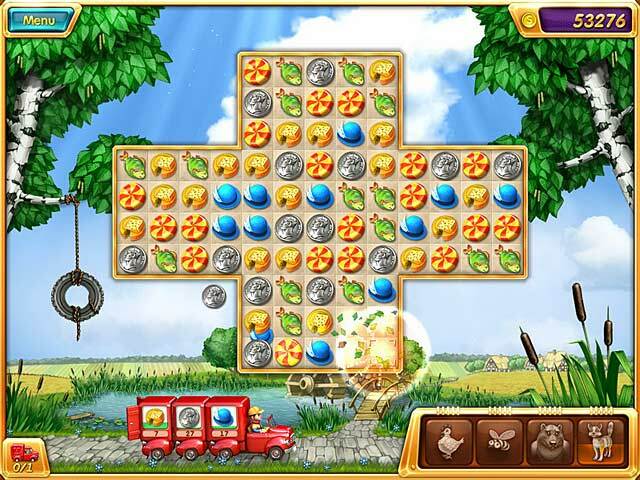 As you add product to your farm, trucks appear in the puzzles. These can be loaded with wares and taken to market to increase earnings. Some of the upgrades add bonus tokens to the bottom right corner which can be activated when filled. There are many awards to earn and add to the trophy room. There are options for music and sound volume. I enjoyed the pleasant sound effects, just a gentle clinking and a few explosions. Good times. Slip on your overalls and bring in a harvest of fun in Crop Busters, a rousing Match 3 adventure for the farmer in everyone!